This was the sight that greeted you as you walked through the door to Yarndale, and it was breathtaking; the photos don't begin to show to bright colours and individual designs that made you stop and really look. Having said that, we were on a mission. A Bunch of Buttons and I had scoped out the Facebook page, Instagram and Twitter feeds of many of the exhibitors and so knew what we were looking for. My shopping list was small; a yarn bowl from County Alpacas, some beautiful hanks from A Stash Addict and a crochet hook from For The Love of Yarn for my lovely newby crocheter, Leanne. Of course, I had still come prepared with a purse bursting with cash, just in case... We quickly worked our way through the things we needed (yes, needed!) as we had a busy schedule. I had secretly booked us both into one of the many workshops that were being held in the main ring. Our class was 'Dyeing to Have Fun', and I selected it because it's not the kind of thing we usually get up to at home. I told Anna over breakfast, when I suddenly had a panic that she might not want to do anything but shop at Yarndale. I had nothing to worry about; Anna was made up that I was treating her to a surprise class so promptly at 11am we took our seats. The class was run by local crafter, Jaki Bogg who was delightfully friendly and calm considering the hubbub of the Workshop Theatre. I had never tried anything like this before and so didn't know what to expect - but I loved it! We were mostly working with acid dyes, as well as natural and food dyes, looking at how different wool materials took to colour and how you could work the dyes. It was a messy business! I had stupidly decided to wear a cream top and cardi (no idea what I was thinking when I packed given that I knew exactly what we'd be doing on Saturday!) but was especially cautious and luckily managed to keep the dye on the table and the wool. Jaki was well prepared and had gloves, aprons, jay cloths and kitchen towel all ready for us. We worked with super soft merino, a complete knitting swatch, a ready made piece of wool as you would get in a skein and wool straight from the sheep! 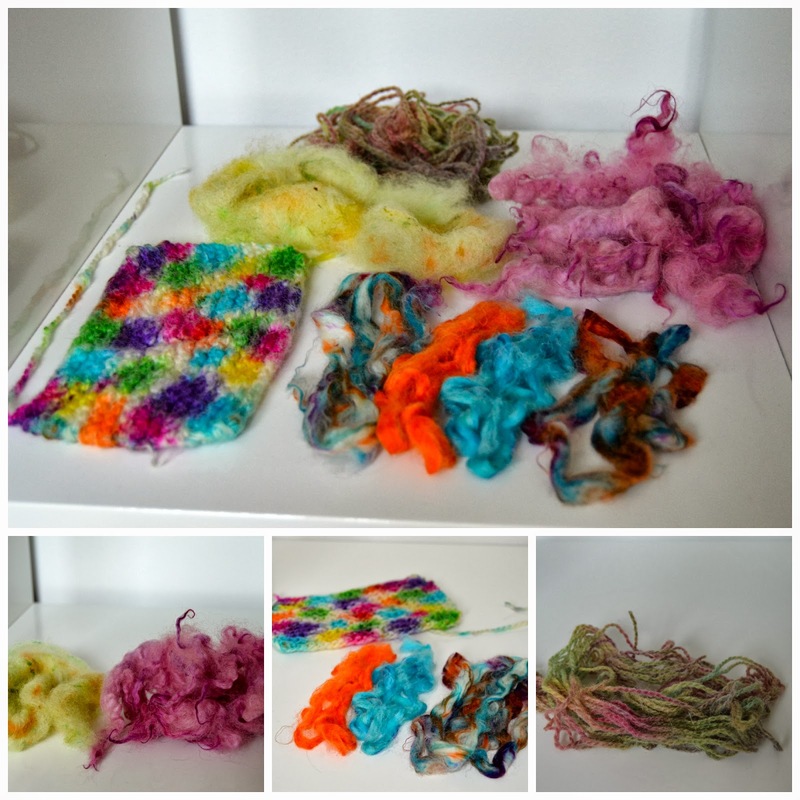 It was amazing to see how differently things reacted to the dye, the knitting took to the dye beautifully, whilst the unprocessed wool was much more difficult to get to the colour you wanted. Here's the finished products. What will I do with them? 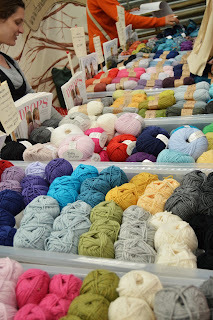 I"m not sure, but I absolutely loved the experience of getting to try something that I would never normally consider, and it's certainly made me appreciate the expertise of the exhibitors showing their own hanks at Yarndale. Once we'd finished the workshop, we quickly got back down to business, shopping! There were so many beautiful, brightly coloured stalls, I loved just wondering around, giving soft merino wools a squidge and stroking the fluffy alpaca furs as you moved between stalls. There were so many pretty items to take home. 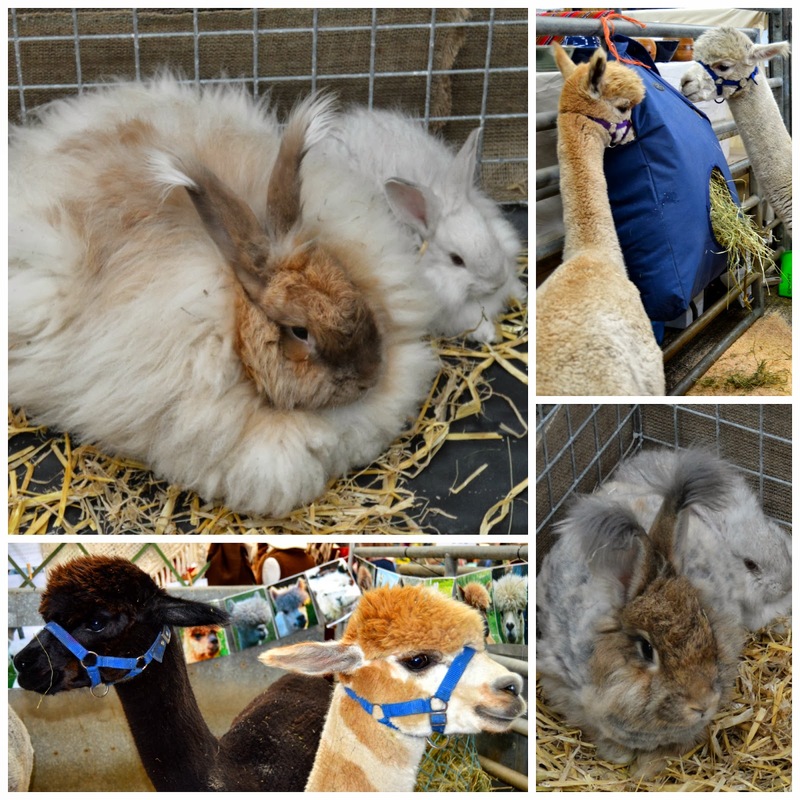 Alpacas and angora rabbits were hanging out at Yarndale too and they were incredibly cute! The Knit 'n' Knatter lounge was right in the centre of the Exhibition Hall and home to Lucy of Attic 24. She had set up an incredible crocheted lounge where she would meet and greet the Yarndalers and it was quite something. Now, I have known Anna for quite some time and there is one thing she rarely does, and that's have photos taken. But I have never seen her this excited before. Like many others, she was dying to meet Lucy and so we duly waited in line for our turn. I'm not sure that I think it's a good idea to meet your heroes, just in case they're not all you thought they might be, but actually, Lucy was delightful. It must be so difficult to make light-hearted conversation with so many people for hours on end, but she certainly made it look easy, and made you feel like she was genuinely excited you were there to meet her too. She even agreed to a picture with Anna, such a rare event that I must show you. The only thing that made Anna even more excited was to see that on the table behind Lucy, right in the centre, was the goat bunting that she had made and sent in. After spending hours telling Anna that there was so much bunting that we'd never find hers, there it was! The day was fantastic. I enjoyed the happy, slightly younger atmosphere and crowd at Yarndale compared to the Knitting and Stitching Show at Kensington Palace that I visited last year. It was nice to see so many local, independent exhibitors here rather than the large commercial companies, (the number of things I now follow on Instagram and Twitter must have trebled!) although I felt that by having so many smaller exhibitors, there was less variety than I had hoped for. That being said, I still managed to return with an overflowing shopping bag! Overall, it was a great experience, and I'm glad we made the long old trek to Yorkshire to be a part of it. The Yarndale organisers should be so proud of what they accomplished; I can't imagine the effort and hard work it must have taken to pull it off, but pull it off they did. 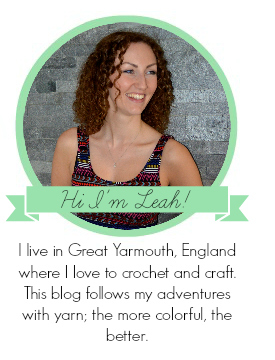 Here's to Yarndale 2014! PS. 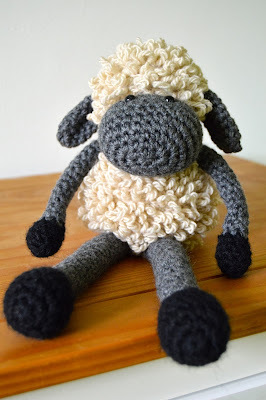 Keep an eye out tomorrow for my Yarndale-inspired first ever pattern - Sheldon the Sheep! Lovely photos, have captured the essence of Yarndale. Who did you buy the wooden wool holder from, please? That's so nice of you to say, I've just got a new camera so was keen to use it as much as possible! The wooden yarn bowl was from www.countyalpacas.co.uk It was a bit pricey, around £24 I think, but I thought it might stand up to my big old husky a bit better than a ceramic one. I've just had a look on their website, and I can't see any of the wooden ones advertised, so it might be worth contacting them to see if they will have anymore soon. I'm not surprised you sold out, the wooden bowls are so different to anything I've seen before, I'm glad I managed to get my hands on one. Unfortunately, I've got to wait to have mine because it's been stashed away as a christmas present... only 79 days to go! Beautiful photos! I love the ones of the workshop because you took far more than I did at my workshop, and your samples came out really well. I looked at lots of yarn bowls and managed to resist (I wanted to spend my money on yarn) but I think if I'd seen the one you had I'd have been tempted to bring one home. It was such a good day, wasn't it? Here's to next year! I really enjoyed the workshop, it was nice to make a mess without worrying about the cleaning! There were so many beautiful things at Yarndale, there was something I wanted to buy wherever I looked. You did well to resist when there was so much on offer. See you there next year! What a detailed write-up - you've really captured the atmosphere of Yarndale. You got a great haul too - I'm quite envious of your rainbowy skeins! Maybe next year I'll have to try a workshop - like you said - just to try something new! The workshop was a great thing to do, especially as everyone was in such good spirits, it was a nice atmosphere. Skeins are from A Stash Addict, I had my eye on them for a while, they had to be mine! Fresh Stitches Kit Club Big Reveal!